I recently visited one of my dearest friends who just became a new mom. As she was telling me about her journeys in motherhood, it dawned on me how little I knew about pregnancy and birth in the modern age. My friend had her baby at a birthing center, rather than a hospital, and in her first few weeks post-partum, a midwife came to her home to check in on everything from breast-feeding to sleeping. I couldn’t help but think how different her experience might have been had she given birth just a few years back. Not being a mother myself, my recent knowledge has been based on what I learned from the BBC show, Call the Midwife. Beyond the medical, the show highlights the historic roots of the modern health care system that are uncannily similar to the health care initiatives of today. The T.V. show depicts post-World War II London and a then-emerging health initiative set in motion by the British government to send trained nurse midwives to women’s homes as they progressed through their pregnancies. The midwives focused their work in a working-class community, where the women often did not have enough money for health care, food, or decent housing. Along with re-purposing community centers as walk-in clinics, this intensive web of services was in response to the high rates of women dying in childbirth, especially among women in poverty who couldn’t afford care in a hospital. With the construction of more hospitals, this home- and community-based approach to health care became less common. Recently, though, there has been a renaissance of community-located care, including health needs outside of pre- and post-natal care. 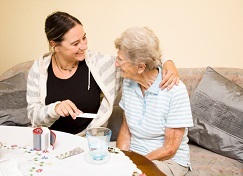 We have observed a trend toward care provided in the home and community settings with the utilization of the community paramedic, community health worker, health coach, and others. These relatively new workforce have been catalyzed by the need to better meet patients where they are and the growing concern around high health care costs. Evidence shows they are making a difference, too. In particular, one research study supports the use of community health workers (or promotores de salud) focusing on cardiovascular health in an underserved Latino community. Participants saw a 20% average decrease in their LDL cholesterol over one year from 108 to 86 mg/dL, which is significant for that short period of time. Dozens of other studies show similar improved health outcomes as well as patients experiencing more confidence and a feeling of support navigating a complex system. In my friend’s case, it was far more helpful for the midwife to assist her through some of her day-to-day tasks with the baby at home, rather than bring back medical advice from a clinic visit. As a result, she has found greater success transitioning into her new role as a mother and the baby is happy and healthy. The return to community-located care not only has the potential to lower health care costs, but it also allows us to work within the environment of the patient and increase access to care. Only time will tell whether the movement achieves the intended effect system-wide.